The second phase of the workshop was Health Information Literacy that was conducted on 12 and 13 February 2012 at the East West University Auditorium. This workshop was specially designed for the researchers, faculty members, health workers and graduate and undergraduate students from different universities of the country. Professor Ahmed Shafee, Vice Chancellor, East West University attended at the closing ceremony as cheif guest. He emphasized that libraries have a pivotal role in promoting health information literacy. Speakers at a seminar on Sunday said digital preservation is a principal consideration in digital library development in the wider Asian region, says a press release. It is based on the part of experience with digital library development and is also part of a study of the literature on digital preservation, they added. 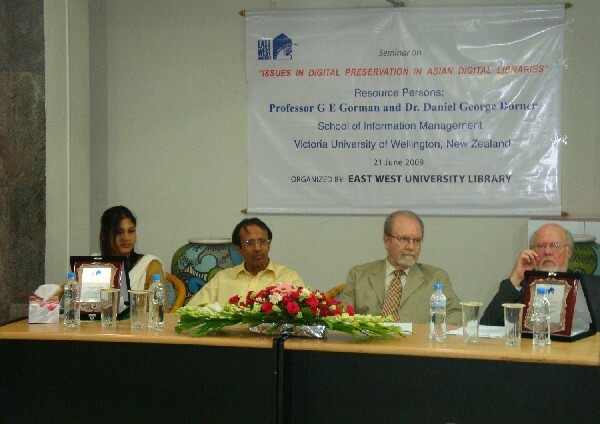 The speakers said this at the seminar on 'issues in digital preservation in Asian digital libraries' was organised by East West University (EWU) Library at its main campus in the city. Automation and digitization are the two valuable and inter-related key elements for establishing a multifaceted modern library system & services for serving the intellectual community with latest information in an efficient manner.